Maui’s North Shore is wonderfully undeveloped. There are no big resorts or condos on the beach, so nature rules the landscape: distant mountains, sea and sky. That's part of what makes the North Shore special. There are many secluded strips of beach from Sprecklesville to Haiku, and other spots that are so secret, perhaps no one has been to them all. The North Shore is popular with windsurfers, kiteboarders, surfers, stand up paddlers, and one-man canoe (OC-1) paddlers. Competitions and events take place year round. This is also part of the charm of the North Shore. Even if you don't participate, it's beautiful to watch. SUP (stand up paddling) race from Maliko Gulch downwind to Kahului or Hookipa. The racers are not standing up yet. In general, snorkeling is not great on the North Shore compared to the West Side of Maui or the South Shore. Maybe the reefs here are not as developed or the wind is stronger. Towns on the North Shore include Sprecklesville (really a mini mini suburb of Paia), Paia - ahippie beach town that I’ll write about soon, Haiku – not a beach town, but parts of Haiku extend to the ocean. By the way, all beaches in Hawaii are public. This means that one does not have to pay to use the beach (unlike parts of New Jersey, for example). Even if a hotel or houses are oceanfront, there must be public access paths to the beach and public parking. Considering how expensive other things are in Hawaii, we are so lucky to have free beaches. Note: One misconception by tourists is that the North Shore is anything located geographically on the north coasts of Maui. Locally, the usage of the “North Shore” refers to the north coast from about Kanaha Beach to Huelo and parts further east. Weather and surf forecasters get around this predicament by using the phrase, "north-facing shores of Maui." For reference, I'm including this map which tries to show some regions on Maui. 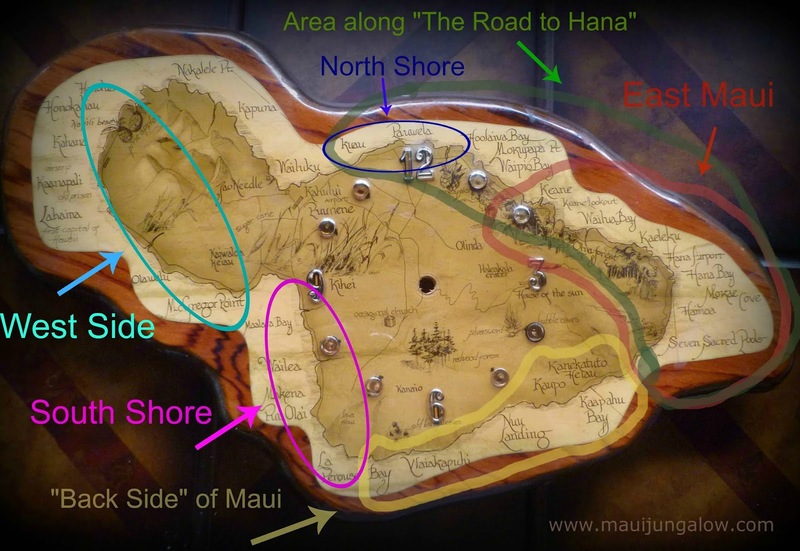 There are two bumps of Maui: the "head" and the "chest" since Maui looks like a person or a bust of a person facing to the left. On the West Side of Maui, i.e. the "head" of the person is not the 'North Shore' " even though that coastline faces north.The South Shore actually faces West. Kanaha – actually in Kahului (aka "town") which is considered Central Maui, but the beach is on the North Shore. Great for beginner and intermediate windsurfers and kiteboarders. Sprecks Beach along Stable Road – series of small beaches and coves in Sprecklesville. Kind of rough, but beachcombing can be interesting. Popular with kiteboarders and windsurfers and it is possible to snorkel here. Baldwin Beach – considered the best all-around beach on the North Shore and good for swimming with protected coves on either end. Paia Beach – right outside the town of Paia, with a youth center, skateboard rink and remnants of WWII bunkers. One small cove is considered “clothing optional.” Don’t be surprised – it’s near the hippies of Paia. Mama’s Fish House Beach – this famous restaurant on Maui is on the beach but there is public beach access. It’s a small but romantic beach and even has good snorkeling. Wonderful tide pools for children. 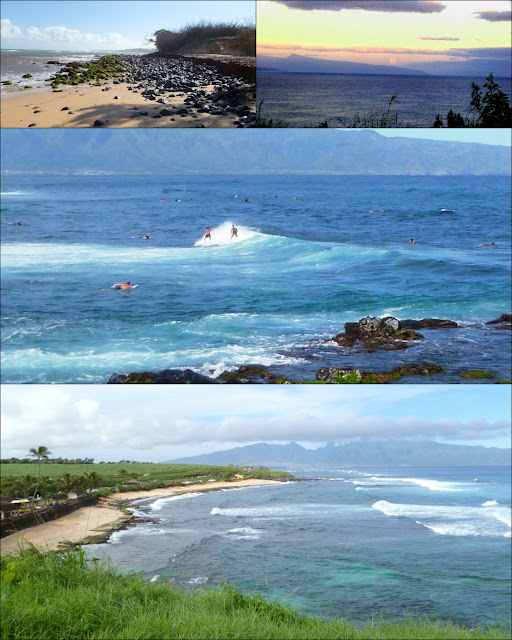 Hookipa – a beach famed for windsurfing. Surfers have beach rights in the morning, followed by windsurfers and kiteboarders in the afternoon. Major athletic competitions take place here. It is possible to snorkel around “the point” in the morning, when conditions are calmer. And lots of sea turtles bask on the sand here. Maliko Gulch – not really a beach, it’s very rocky. 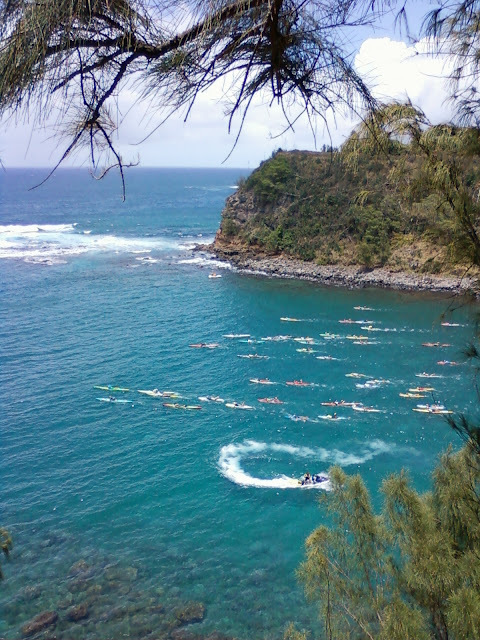 It’s where boats and ocean races often start, and then go “downwind” – to the west, meaning towards Kahului. Jaws – a crazy wavy surfing spot in Haiku, that only professionals try to surf or windsurf. Maybe the hugest surfing waves in the world? The North Shore of Maui.